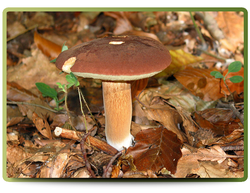 The Bay Boletus, also known as the Bay Bolete, is an edible pored mushroom. As the Bay Boletus matures it's cap can grow up to 15 centimeters in diameter. 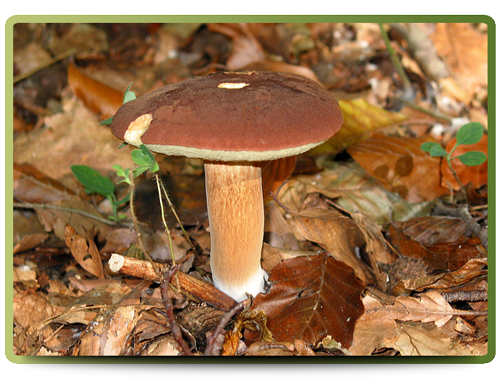 The fruit body has a chestnut to dark brown cap that is convex in shape and flattens slightly as it matures. The pores on the underside of the cap, which are easily removed from the flesh, are cream to pale-yellow and changes to a greenish-yellow colour as they mature. The pores are 0.8 to 1.5 centimeters deep . The stipe is smooth, cylindrical and can grow from 4 to 9 centimeters tall and up to 2 centimeters in diameter. The stipe's colour is similar to the cap, yet slightly paler and sometimes has a rose- coloured tinge.